We’ve received more information on the update to the YX510 – the most popular home/office repeater kit in the US. The update is going to be called the zBoost SOHO YX545. We covered the announcement previously in this post, but we now know a few more details. The old kit was called the ‘zboost YX510′. The new kit will be called the ‘zBoost SOHO YX545‘. This follows a recent trend with Wi-Ex for giving their products more than a manufacturer part number. This started with the kit recently released for the small apartment buildings – the ‘zBoost Metro YX540‘. We imagine this will be come started practice for Wi-Ex going forward. The YX*** codes that they give their products are pretty meaningless, and it’s good to see a more easily identifiable naming structure. The new zBoost SOHO YX545 lists a system gain of 60dB, a good increase from the 53/54dB of the YX510. Gain is a logarithmic scale where an increase of 6dB doubles the coverage area. It’s interesting to note in the PDF overview that Wi-Ex still list the coverage area as up to 2,500 sq ft – identical to the YX510. This is probably Wi-Ex moving to a more realistic expectation of coverage area. With the YX510 2,500 sq ft was only possibly with a strong input signal from the external antenna. Hopefully with the SOHO YX545 a few bars will get the unit up to the max. Another big change is the coaxial cable included in the standard kit. The YX510 had 35ft of RG6; the SOHO YX545 will have 50ft of RG-59. 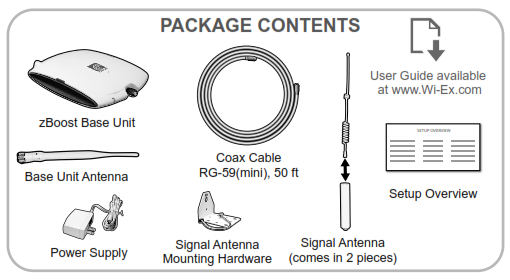 The extra cable length will help with installations, allowing more flexibility in the antenna placement. Running the cable discretely through the home will also be easier as RG-59 cable is thinner and more flexible than RG-6. The standard omni-directional external antenna also looks different from the one included in the YX510. It’s unclear if the antenna is more powerful, or just has a different form.